This massive necklace is composed of 10mm turquoise heishi. In a beautiful light blue. The turquoise heishi have some light gray matrix as shown. They are on sturdy wire with cones and a hook clasp. The necklace is about 20 long. The necklace has a traditional cone and hook closing. Keep an eye on our mstcwrld7 ID. Please Note: this listing is only for the necklace in the first photo. 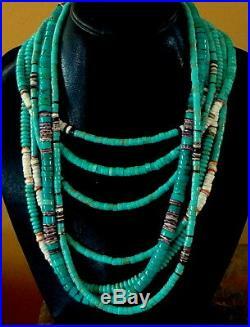 But we have other turquoise heishi necklace that would look fabulous worn together. Collect them, and create your own Native American look! The item "MASSIVE 10 MM TURQUOISE HEISHI BEADS NECKLACE SPECIAL SALE" is in sale since Monday, December 24, 2018. This item is in the category "Jewelry & Watches\Ethnic, Regional & Tribal\Native American\Necklaces & Pendants". The seller is "mstcwrld7" and is located in Sedona, Arizona. This item can be shipped to United States, Canada, Mexico.